KH Industries Quad Light now includes 3,200 and 7,200 Lumen LED models. Up to 20 lights can be daisy chained together for a continuous light output that is intensely bright and extremely durable. HAMBURG, N.Y. - June 9, 2014 - PRLog -- KH Industries, U.S. manufacturer of industrial grade lighting and power products, has expanded its offering on its Quad Light to include 3,200 and 7,200 Lumen LED models. The Quad Light (visit: http://www.khindustries.com/63/Portable%20Lighting%20Systems/catalog.html) is known for its durability and is the industry standard for rugged, wide area lighting in large scale manufacturing, and in the overhaul, maintenance and repair industries. Now with the recent dual cUS/CSA Certification for the 3,200 Lumen and the 7,200 Lumen models the LED Quad Light will deliver even more durability as LEDs are virtually unbreakable. The LED Quad Lights can be used for feed through lighting or single use. 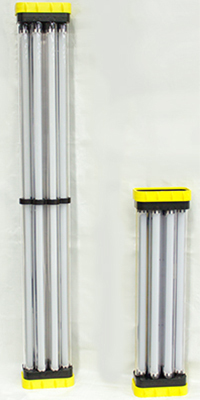 They are available with clear tubeshields for 360° wide area lighting or reflective tube shields for focused task lighting. The lights have flexible positioning and can hang, stand, or lay on the floor, they also come with mounting straps and 45° angled feet. Contact http://www.khindustries.com/home.html for more information, including available models and pricing.